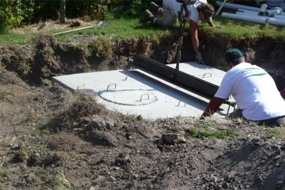 A basic septic system consists of a tank and a drain field (or leach field). It may also have a distribution box and sometimes will have a pump. 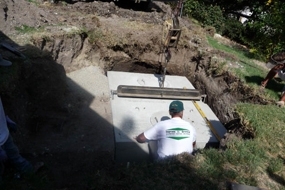 The purpose of the septic system is to treat household waste. One could say that the tank acts as a “solids trap.” Inside the tank, solids are separated from the liquid and held to allow bacteria to break them down. Once broken down to liquid form, they pass into the drain field where they are filtered into the soil. The solids that remain either float on the surface or sink to the bottom. That is where we come in. If these solids are not removed, they can eventually slow down or even stop the flow to the drain field. Even worse, the solids can get into the drain lines and plug them. This sometimes leads to a very expensive repair. 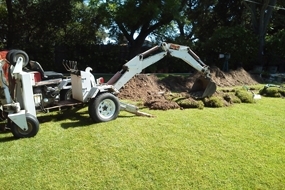 Like changing the oil in your car, pumping out your septic tank should be routine maintenance. For a family of four, it is recommended that you pump out your tank every three to four years. Don’t wait until that dreaded backup. Waiting for a symptom that something is wrong could be a costly mistake. 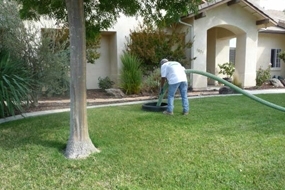 The cost of a pump out will pale in comparison to a repair job. 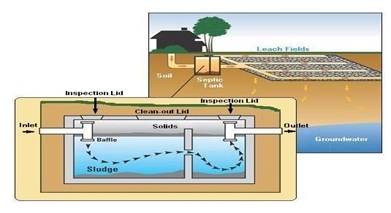 The diagrams below will further explain how a septic system works. A “pump out” sounds like a simple operation, right? Wrong. Actually a properly done pump out consists of several things. First, both lids must be uncovered and removed. Then there is the removal of those stubborn solids. This is usually quite a task. Simply, dropping in a hose and pumping out the liquid would be easy but would also be useless. (After all, the liquid is not the problem.) During this process, the tees and baffles are checked for proper placement and/or problems. If your system has an effluent filter, it will be cleaned as well. After the tank is thoroughly cleaned, the lids are replaced, then carefully and neatly covered. 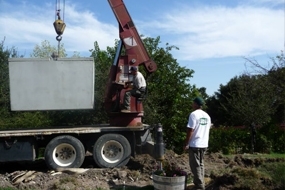 Your septic system may consist of a pump. Pumps are used when the drain field is at a higher elevation than the tank outlet. They pump the liquid from the tank to the drain field. Many times, pump failure is a direct result of poor maintenance. Because these pumps are designed primarily to handle liquid, if a tank is not pumped out on time, solids may enter the pump chamber and cause it to fail. We at Ingram & Greene will diagnose and repair these systems should they fail. If you have a pump on your system, chances are you also have an alarm. Alarms are set to alert you if you pump should fail to remove the liquid from your tank. Your alarm should sound before the tank is completely full. 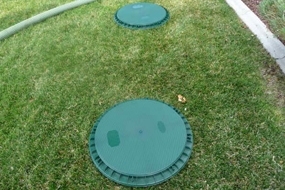 This allows for some emergency storage space to allow time to repair or replace the pump before the tank overfills. 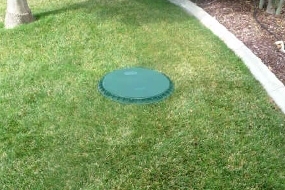 Septic tank inspections are most often performed when someone is buying or selling a home. 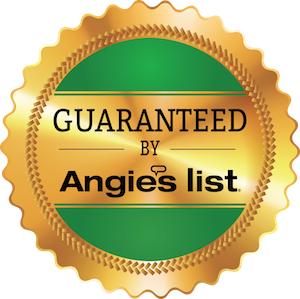 This simple but important service can alert a buyer or seller of a potentially costly problem. While we don’t have a crystal ball, we can usually spot a potential problem with the system. At the time of inspection, the lids should be exposed and the water to the house should be turned on. This is necessary to insure proper flow through the system. We will also be able to check that the inlet and outlet tees are in place.